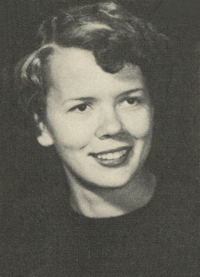 Obituary – Bruner, Barbara Kaye (Dolezal) « Perry High School Alumni Association, Inc.
﻿Red Hots 47-50, Red Hot Cheerleader 48-50, Annual Queen Attendant 47-48, Band Queen Attendant 46-47, Y—Teens 47-48, Junior Play 48-49, Home Room Secretary 46-47, Library Staff 46-47, Office Staff 47-48, Football Queen Manager 48-49. Barbara Kaye Dolezal Bruner was born in Perry, Noble, OK, October 8, 1932, to Joseph Edward Dolezal and Lydia Helena Freese. She passed away on October 9, 1986 in Tehachapi, CA. Barbara Kaye married Merlin G. Bruner. She is survived by six children: Steve Bruner, Cindy Bruner McMullin,­ Doug Bruner, Joe Bruner, Rebecca Bruner Featherstone, and Leah Bruner Rennie, and a sister: JoEllyn (Dolezal) Livesay.